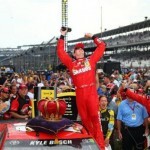 Note: The above photo was taken when Tony Stewart won the 2005 championship. Pictured from left- JD Gibbs, Tony Stewart and Greg Zipadelli. A key figure at one of NASCAR’s most successful racing teams is gone. JD Gibbs has passed away after a long battle with a neurological disorder that affects brain function. He was 49 years old, and he leaves behind a family that includes his wife and four sons. 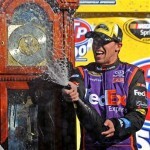 Joe Gibbs Racing is renown as the team founded by JD’s father, the NFL coaching legend Joe Gibbs. From the inception of the team, JD Gibbs was involved in his father’s team. The former college football player was a tire changer for Dale Jarrett, and even raced for a period of time in the truck and Xfinity Series. JD Gibbs eventually became team president. Many will remember JD in victory lane alongside the likes of Tony Stewart, Denny Hamlin and Kyle Busch. His leadership was especially significant during a time when the elder Gibbs was coaching football. He was right in the mix of things until the announcement of his illness in 2015. In terms of personality, the fruit didn’t fall far from the tree. JD Gibbs exuded a positive attitude and was never known for making headlines of the wrong kind. Managing the extreme personalities that occupy the driver’s seat of a race car is no easy task. Though highly talented and successful, JGR has has been no stranger to controversy. After years with Oldsmobile, JGR switched to running with Toyota. The team has pretty well been the standard bearer for a car maker that ruffled some feathers as a “foreign” manufacturer. Gibbs took some heat from that and had their values questioned, given some of the driver behavior, and the times JGR has been fined for breaking the rules. If we as fans put aside our loyalties for a moment, let us remember we are all part of a greater race- the human race. Though many may have rooted against his team, JD Gibbs was a husband, a father, a son and a brother. By every indication, JD Gibbs was a beloved boss. Let’s not forget that. If you believe as this fan does, Jason Dean Gibbs is now free from illness and has passed to a wonderful place of joy and peace. It’s his family, friends and associates we grieve for, as he will obviously be missed. So long, JD Gibbs, you ran your race well. Enjoy the spoils of victory. 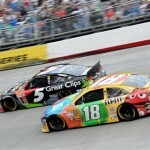 How Long Can NASCAR’s “Odd Couple” Co-Exist?